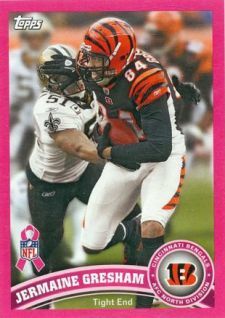 Throughout October, the NFL had its "A Crucial Catch" campaign to raise money and awareness for breast cancer research. Over the course of the month, there were several auctions and events to highlight the cause. 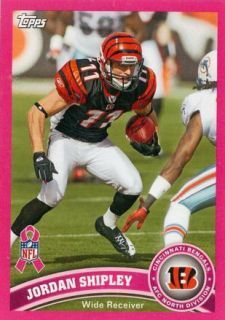 Panini was very up front about promoting the set of cards they gave away as a part of the event. 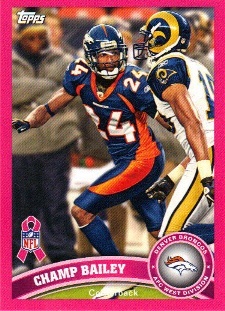 Panini even offered cards as a giveaway to collectors buying things from the Pro Football Hall of Fame online store. 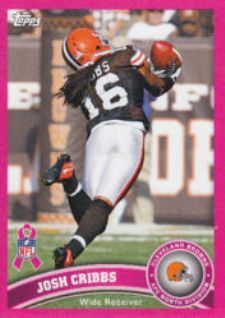 However, Topps snuck in with a set of their own that has been largely overlooked. 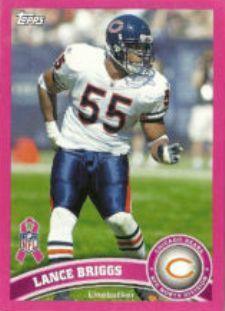 Offering pink-bordered parallels of the base 2011 Topps Football cards, they would make a striking addition to any player rainbows. Leading the way in sales, both in price and quantity is Cam Newton. After initially going for more than $50, ungraded copies have settled in the $30 range. A PSA 10 copy sold in early November for $385. That priced dropped when another went for $201.50 three weeks later. A BGS 9.5 copy sold for $161.50 on November 22. The Newton card appears to have only been available as a stadium giveaway in Charlotte. 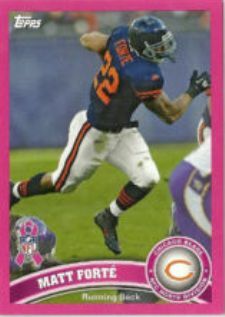 Other team-themed packs were handed out throughout the league. It looks as though four cards came in each team pack: two Topps and two Panini. 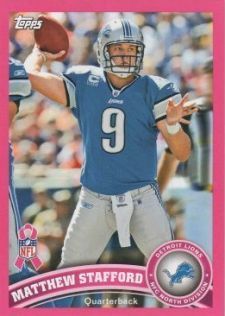 Besides Newton, highlights in the Topps set include Matthew Stafford, Troy Polamalu, Aaron Rodgers, Matt Forte, Colt McCoy and Ben Roethlisberger. Common cards normally sell for less than a couple of dollars with stars commanding up to $10 each. We have contacted Topps requesting a definitive checklist for the set. Thus far, we haven't received one. 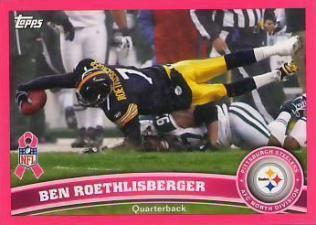 Below we've put together a gallery of some of the cards we've seen. If you know of any others, please post a comment below with the player and number if possible. Ive seen one of these serial stamped 4/5. Did they make short print ones or these?? 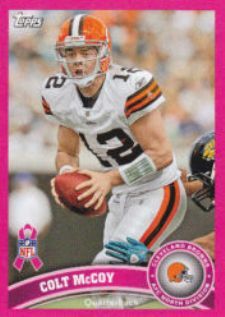 All the pinks I’ve seen are not numbered?? steven straineri � I personally haven’t heard of any being stamped. Do you know how the one you saw was acquired?